Me ~n~ Lippmann Are Celebrating! HAPPY BIRTHDAY TO YOU and me … HAPPY BIRTHDAY TO YOU and me … HAPPY BIRTHDAY DEAR LIPPMANN COLLECTION and meeee, HAPPY BIRTHDAY TO YOU and me! Celebrate - 10th Anniversary Collection Set ($35 @ sephora.com) are three shades in a bangin’ cute box. While I am a few years older than this, we are both celebrating today, August 22nd. And what’s cool about each shade is that they contain not just regular glitter in each color but pretty big pieces so it gives nails a nice texture. I have had a strange nail polish week. I have been back and forth on my nails with Before He Cheats (light pink) and then Makin’ Whoopee (iridescent rose) both from the DEBORAH LIPPMANN brand. Ever have one of those weeks? Both are great shades and I guess I’m just exercising my right to change my female mind, even if it is everyday! $15 @ sephora.com. 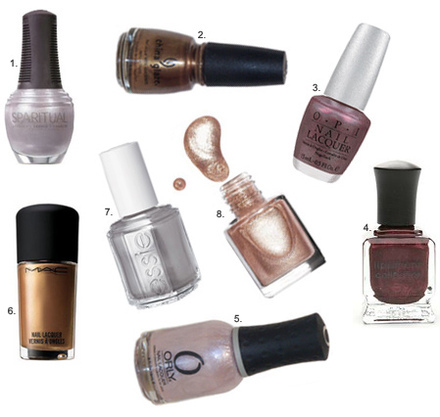 Nails are my other feature that simply loves Metallics!